This unit has been recently updated with new paint, tile, carpet, wooden blinds and furniture. There are five bedrooms and four bathrooms. 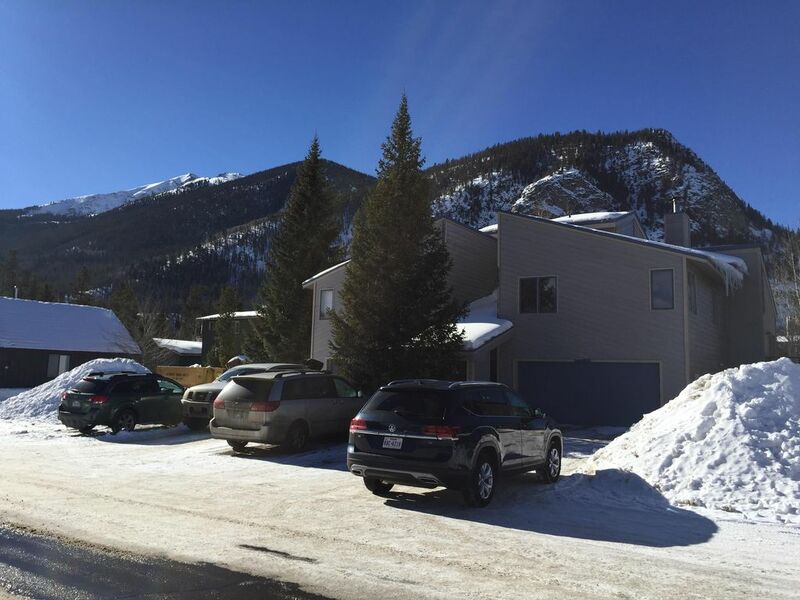 This duplex is located one and one half blocks from Main Street, in Frisco, the heart of Summit County. This unit is ideal for couples, not only because it is spacious, but it has one king and four queen pillow top beds in separate bedrooms. All the ski areas are accessible from the free shuttle stop just four blocks away. For summer guests the bike path is four blocks away. Sleeping Arrangements: The top floor master bedroom, is a king suite with a double sink vanity and a full bath. One level down are two bedrooms, one with a queen bed and a full bath in the hallway. The other has a queen bed and a private full bath. The garden level has two bedrooms, each with a queen bed and TV. These two bedrooms share a full bathroom. There is a family room outside these two bedrooms and new TV. There is also 2 new full size mattresses available for overflow sleeping. You can access these two rooms by a private entrance. There is also a walk out patio off this family room. Floor Plan: This large duplex has four levels. The living room on the main level, has vaulted ceilings and windows facing North and West. ENJOY THE NEW 40' HDTV SONY FLAT SCREEN. ALSO JUST ADDED HIGH SPEED WIRELESS INTERNET! Warm it up with the wood burning stove. The large tiled dining room has a beautiful dining room table and wood/fabric chairs. Enter or exit the wrap around deck from the dining room or living room. Enjoy a summer BBQ w 2 patio sets and a GAS grill with beautiful mountain views. The breakfast bar and four matching bar stools separate the dining and kitchen area. The tiled and spacious kitchen is fully equipped. It has an oven, Gen-Aire stove, large refrigerator, dishwasher, and microwave. There are new full size Samsung washer and dryer on the main floor. Second level has 2 queen bedrooms, 2 baths. Third level=master suite. Garden Level has 2 queen bedrooms, and 1 bath. This townhome has a 2 car garage. This townhome is 2,637 square feet. WE DO NOT RENT BY THE MONTH/SEASON IN THE WINTER! We loved the location! The layout and size was perfect for our family. The condo is very tired, needs improvements. The snow was not shoveled off the deck so very icy to use the grill. Beds were a little soft! The home is beautiful, very roomy, comfortable and convenient. It is in walking distance to the shops in downtown Frisco. With 5 bedrooms and 4 bathrooms, we had plenty of room for our extended family to spread out and be comfortable. It is in easy driving distance to the ski slopes. Awesome family and friends ski trip!! Back in Atlanta after an absolutely awesome ski trip with friends and family. We stayed in the condo with 4 families( maxed out with 15 guests counting children), and this place accommodated us perfectly! Very roomy and not crowded at all. We walked to the beautiful little town of Frisco from the condo and shopped and ate. Bus transportation was so convenient that we rarely used our vehicles. We skied, snow tubed., and LOVED Copper Mt !! Easy and short drive or take the free bus to the beautiful town of Brekenridge. The condo was perfect for our large family, and location with bus access made it so easy for us to all be able to go and do as we each pleased.. Would definitely recommend this condo for the niceness, location, and the affordability of this condo could not be beat!! Would deffinetely recommend and would love to visit again!! One half block from the middle of Main Street, Frisco.